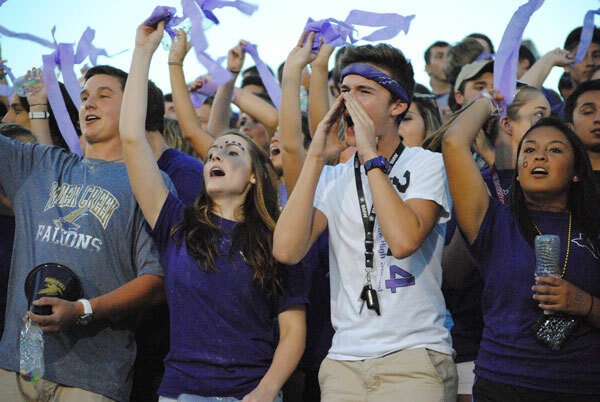 Falcon Fans cheer on their team during a Sept. 4, 2014 football game. Photo by The Creek yearbook photographer Kaitlyn Cass. Hey Falcons! Our own Recie Saunders has been nominated for the dfwVarsity Player of the Week — but we need your help! Vote for Recie using this link to help him win this week’s honor. Voting ends Wednesday, Sept. 10 at 3 p.m.
“Timber Creek RB Recie Saunders rushed for 194 yards and 2 TDs and caught two passes for 20 yards and 2 TDs in the Falcons 47-44 overtime win against Burleson. His second touchdown catch was for the OT win.” Read more here. dfwVarsity is a high-school football focused publication from the Fort Worth Star-Telegram newspaper.